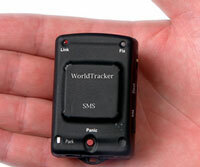 The WorldTracker SMS is a small GPS device powered by the SiRFstarIII chipset (which includes WAAS for signal correction/accuracy) and includes a built-in tri-band GSM module for sending tracking messages via SMS to as many as seven cell phones or PDA’s. With Security Concepts’ monthly service offerings, you can also track your target using Google Earth – a first in the industry for real-time trackers. The device can run for up to 24 hours on its own internal lithium-ion battery, or with the inclusion of an external battery pack anywhere from 4 to 15 days.